NDITM is a technology that makes it easy to send and receive multiple channels of broadcast quality, low latency video over an existing Gigabit Ethernet Network. File Sharing has been possible for decades over a local network, so why not live video? With NDI, this is now possible and in a way that makes it perfectly suited for title maker applications like CICADA. CICADA can send its title screen through NDI, without any further hardwares. You can use this title screen within any NDI compatible systems. 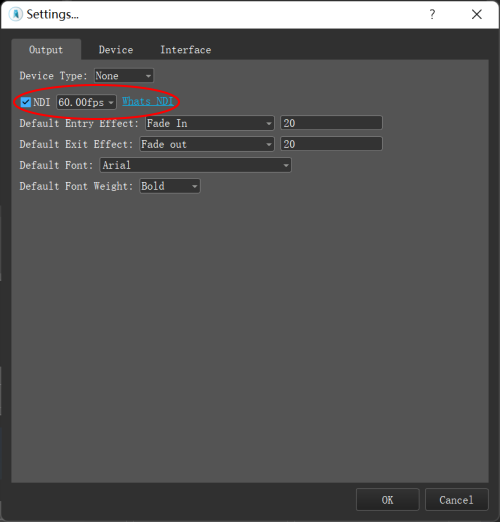 All you need to do is as simple as check the NDI option in the settings dialog.